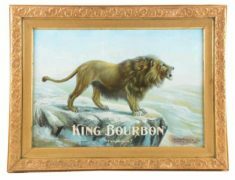 Featured is a beautiful rolled or curled edge sign from the Paul Jones Whiskey Distillery company which was in Louisville, Kentucky, prior to Prohibition in the late 1800’s and early 1900’s. This tray features a image which was a popular mythological story of the era. 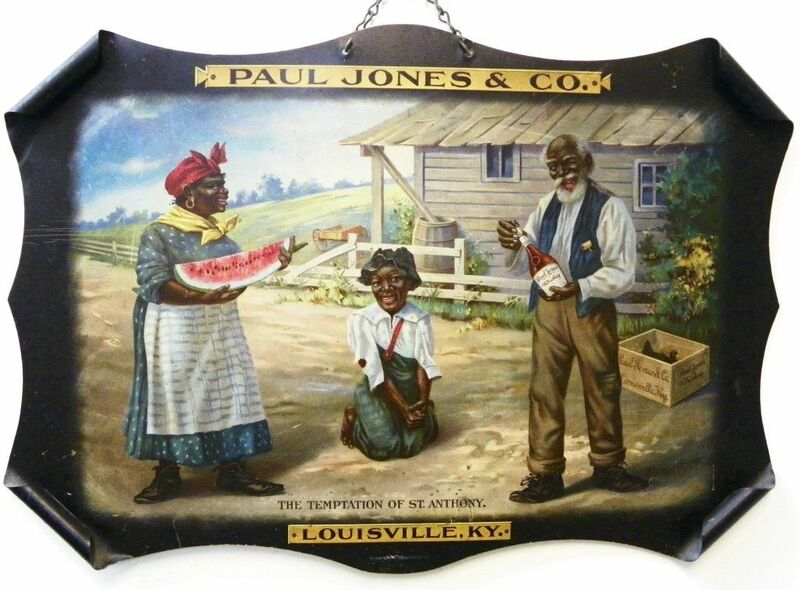 Today, the sign would not be considered acceptable in modern society, but today black Americana signs are collectible for many as examples of the progress in thinking which has occurred fortunately. The sign has a small chain link attached to it designed for hanging purposes. 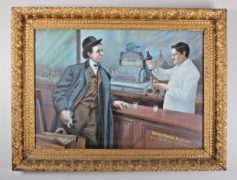 Here’s a really neat looking early lithographic sign from the Brown-Forman Distillery which was based in Louisville, Kentucky prior to prohibition. The image shows a bartender providing a pour of whiskey to a patron standing near the long wood bar. Here’s an early lithographic print from the Old Forester Brand of Whisky, stating “Guarding A Good Thing in Arizona”. This print is circa 1910, and from the pre-prohibition era. The Brown and Forman Company was a Louisville, KY based whiskey distiller. 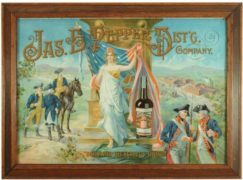 James E. Pepper Distillery in Louisville, Kentucky produced this beautiful tin sign. Born in the Republic, 1780 reads the caption in the colonial military scene. 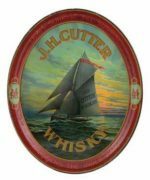 Early meyercord style wood sign from the Schuckmann & Seligmann Whiskey Distilling Company in Milwaukee, WI. Pre-Pro era Reverse on Glass outdoor hanging sign, I.W. 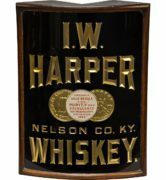 Harper Brand of Whiskey, Nelson County, KY. Here is an early reverse on glass sign from the S. Hirsch & Company Whiskey Distillery in Kansas City, MO. 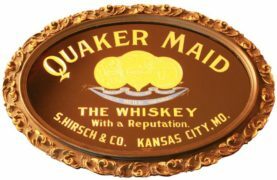 The sign is for their famous Quaker Maid Whiskey brand. This sign is a pre-prohibition era advertisement, circa 1900. Pre-prohibition era serving tray from the Adolph Loeb Whiskey Distiller Company in Cincinnati, Ohio. 2 O'clock Club Rye. Pre-Prohibition Whiskey Bourbon Sign for the OFC Brand which was sold by George T. Stagg Distilling Company in Frankfort, KY. The originator of this whiskey was The Taylor Company. Beautiful Whiskey Decanter from the White Lily Brand. This porcelain china jug was made by the KT&K Pottery works which was based in Ohio. This is a beautiful painted enamel glass decanter from the J&G Stewart's Scotch Whiskey.